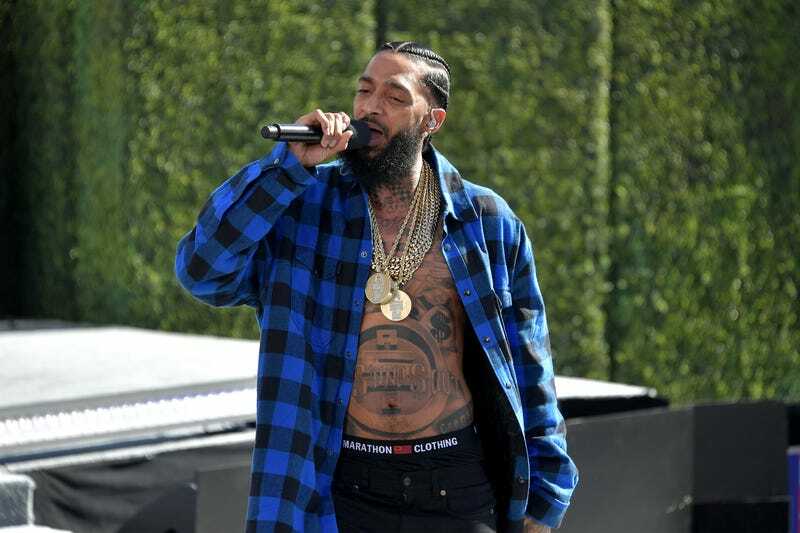 It what may be cold comfort as fans, friends and family continue to mourn Nipsey Hussle, sales of the independent rapper’s music have risen 2,776 percent since his untimely death. Initial reports to Nielsen show that on the day of his death, Sunday, Hussle’s songs and albums “sold a combined 15,000 copies—up 2,776 percent compared to a little under 1,000 on Saturday,” Billboard reports. The No. 1 stunna? “Racks in the Middle,” Hussle’s recently released single featuring Roddy Ricch and Hit-Boy. It sold nearly 3,000 downloads Sunday, up 1,507 percent compared to Saturday, according to Billboard. On Wednesday, Hussle’s major-label debut album, 2018’s Victory Lap, was No. 1 on the iTunes albums chart, while his 2013 mixtape, Crenshaw, was No. 5. Several of Hussle’s songs, including “Racks In the Middle,” “Double Up” and “Grinding All My Life,” have landed on the Spotify and iTunes charts. By mid-afternoon on Wednesday, 10 of the Top 50 songs on Apple Music belonged to Hussle. It is often the case that artists gain greater fame following their deaths, but in Hussle’s case, the business savvy he demonstrated during his life may also mean greater security for the family left to mourn him. He owned the masters to his music, according to the Source.